Latest Fiji Tropical Cyclone Update From “Accuweather”. There is no official warning at this stage – just weather experts keeping an eye on the tropical low close to Fiji. Presently, the storm brewing is considered a category one cyclone. It is expected to hit the country by Saturday. Hopefully this will bring inclement weather only. Those in low lying areas are advised to move to higher ground in preparation for flooding in some areas of Fiji. Our prayers go out to Fijians as they face the threat of cyclonic weather – most notably flooding and torrential downpours. 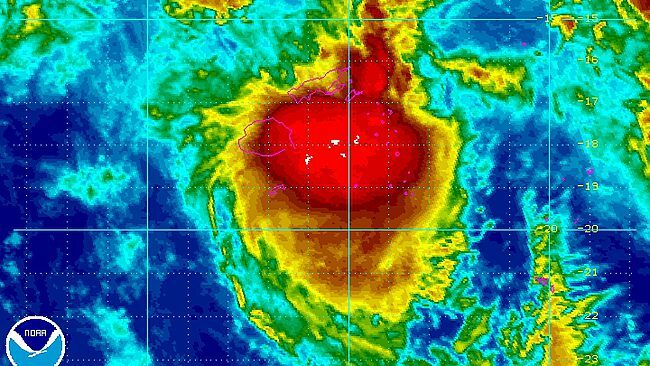 Director Fiji Meteorology Alipate Waqaicelua told FijiLive the tropical cyclone is expected to affect Fiji throughout the weekend. “The confirmed assessment as of now is that a tropical cyclone will hit Fiji by Saturday, moving across the country and heading towards the South,” Waqaicelua said. The AccuWeather.com Hurricane Center is keeping a close eye on another tropical low spinning immediately to the east of Fiji. A tropical cyclone with its strength equal to that of a tropical storm is expected to take shape gradually as the low spins near Fiji through Thursday (local time) then crawls southeastward later in the week. Due to the compact nature of the low, eastern parts of Fiji will be most at risk for experiencing flooding downpours. The threat of flooding rain and damaging winds will then shift to Tonga this weekend as the low tracks southeastward. This weekend is also when another tropical cyclone may begin forming south of the Solomon Islands. Latest indications point toward this future tropical cyclone dropping southward through the Coral Sea next week and possibly becoming stronger than the low currently near Fiji. AccuWeather.com meteorologists will be closely monitoring this area for potential impacts on eastern Australia later next week or the following weekend.